For Queen Victoria, life in the palace had its advantages, but it also had its disadvantages. The rules of etiquette which restricted the lives of sovereigns made even the most luxurious of royal palaces become, what the Empress Eugenie called the Tuileries—“une belle prison.” For a reprieve, the Queen and Prince Albert escaped to their Highland home, Balmoral Castle. 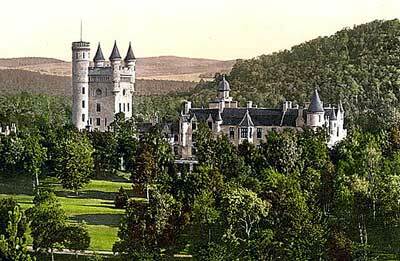 Balmoral, described by the queen as “my dear paradise in the Highlands”, was the Scottish home of Queen Victoria. Victoria’s love of Scotland stemmed from the novels of Walter Scott that she had read as a child, and the Highland landscape reminded Albert of his native Franconia. For the Highland country, Victoria’s attire was solid and strong. It was formerly thought not proper for a lady to wear anything but thin Morocco shoes or very slight boots in walking, but for her visits to the Balmoral, clogs and galoshes were necessarily resorted to. Victoria also adopted the retrousse (looped-up) skirt and the red and black worsted petticoat while on her visit to Balmoral for outdoor wear. Subsequently, in the 1850s, the name of “Balmoral” was given to various articles of clothing possessing unusual strength and weight, in imitation of the materials or style of those worn outdoors by Victoria or the members of her family during visits to the new royal residence. The Balmoral petticoat, a woolen petticoat originally red with black stripes, was intended to be displayed below the skirt of the dress, which was looped up over the hoopskirt. The gown skirt was looped up about a foot at every seam to display the petticoat, and thus hung in festoons and folds. Victoria assumed the Balmoral petticoat for health, comfort, and warmth. She accompanied it with the Balmoral boot, and even with mohair and colored stockings. The warm cloak, the looped dress, the shady hat, completed a new style of country walking dress.Wherever the fashion conscious lady travelled out-of-doors, she would find that Balmoral boots, scarlet petticoats, and feathered hats had become necessary equipment. The Balmoral design above was manufactured by Messrs. Douglas & Sherwood and featured in Godey’s Ladys Book in 1858. It combines both the hoop and colored skirt similar to that adopted by Victoria. 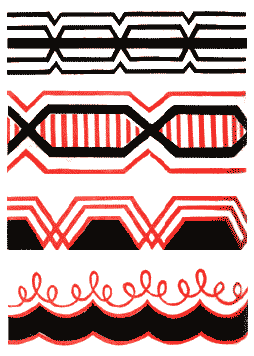 The material is woolen, red and black in graduated stripes reflecting a “peasant” flair. This “Highland” costume was featured in Peterson’s Magazine in 1861. The charming dress was said to be “suitable for the country.” In the engraving the skirt is fastened up with “pages”, but can also be made to fasten up on the inside by placing a few buttons around the skirt, and looping them up with tape strings hanging from the waist. With this dress, a Balmoral skirt was indispensable. Some ladies made the petticoat of plain gray flannel, and ornamented it with rows of red cloth or flannel. Here a loose jacket is worn over a linen chemisette in place of a tight body. The jacket is ornamented with braid and buttons, and opens at the throat. The Balmoral petticoat was popular for years. Again in 1865, Peterson’s Magazine featured this hand-colored engraving with designs for trimming Balmoral petticoats. Victorian robes of silk and lace decorated with embroidery, buttons and tassels.